Lint accumulated in dryer vents is a common cause of household fires, and regularly servicing your dryer can help prevent this risk. Our Technicians conduct a thorough dryer vent cleaning service by cleaning the main dryer duct, connector and the dryer lint trap. 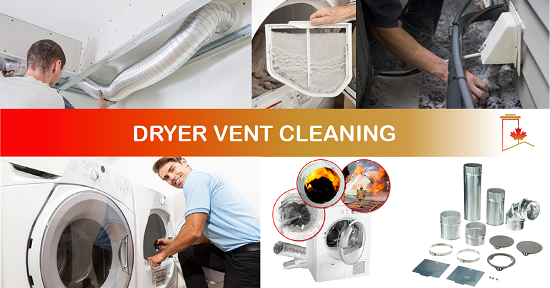 We offer three dryer vent cleaning service packages, and custom dryer vent add on services which allows you to create a custom experience that will suite your specific needs and budget. A dryer will me more energy efficient and fire safe when the ducting and vent are regularly cleaned out and maintained. Cleaning your dryer vent can greatly improve your dryer’s energy efficiency. Call us for all of your dryer duct vent installation and repair needs. Prior to your scheduled dryer vent service, please create an unobstructed work space of 4'x4' so that our Technicians can readily access the dryer, dryer vent and spaces that are to be serviced. Below is a step by step guide on how to prepare for your Canadian Chimney Dryer Vent Cleaning Service. 1. Move all items and materials that are on or near your washer and dryer within 4'. Click on the button below to direct you to our web-page with Dryer safety tips from the National Fire Protection Association (NFPA) will assist in your dryer venting efficiency and will help keep your family safe. The leading cause of house fires caused by a dryer is not cleaning them.